On December 3, the Vancouver Ecosocialist Group put on an event, “Strategies to Stop Climate Change.” We are republishing the speech by VEG member Gene McGuckin. A report on the event and links to videos of all the speakers’ talks is online here. Video of Gene McGuckin’s speech at the Vancouver Ecosocialist Group event on December 3, 2013. I thank the speakers before me for their valuable contributions – in actions as well as words — to the discussion at hand. So, what does an eco-socialist perspective add to these contributions? We all start in the same place, of course. Stopping climate change means stopping greenhouse gases, which means blocking fossil fuel corporations from extracting and transporting oil, gas, and coal. Like Rising Tide, we believe this task cannot be accomplished under the capitalist system. Not quickly enough, not thoroughly enough, and—really—not at all. Capitalism cannot be reformed or wear a human face or be less destructive. It will have to be abolished and replaced. Evidence pours out of the media daily showing that the corporations controlling the capitalist system and their bought-and-paid-for governments won’t stop climate change. As extreme weather events multiply, killing thousands and sentencing millions to harsh and harsher living conditions, fossil fuel corporations accelerate mining and drilling operations. When forecasts of super-costly damages from climate change issue from virtually all scientists AND from economists at the World Bank and IMF, billionaire investors like the Koch brothers react by financing campaigns of denial that climate change even exists. Governments like the BC Liberals and the Ottawa Conservatives promote coal mines and pipelines and fracking and liquid natural gas (LNG) plants—pledging to subsidize them with our tax dollars. They repeal legislated protections for clean water, healthy fish habitats, fertile lands and for the people whose lives and livelihoods depend on these protections. Global has and will continue to cause an escalation in destructive storms. Photo by Ezekiel R. Kitandwe, AP. Cities already hit by extreme weather events don’t focus on curbing GHG emissions but on building projects that might reduce damage next time. Calgary wants dry dams upstream on the Elbow River. NYC plans barriers to keep the subways from flooding. Washington, D.C. builds an 8-foot wall to protect the monuments on the Mall and parts of its downtown. New Orleans has new dikes and flood gates. As our movement to fight climate change grows around the world, supposedly democratic governments in Canada, the US, etc. activate spy agencies to keep track of us. They make new laws to facilitate the suppression of peaceful protests and the jailing of protesters. 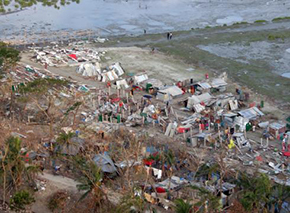 On the international level, intelligence agencies warn of coming social upheavals and wars caused by famines, disputes over resources, and mass migrations of people driven by climate change. So, governments in Washington, London and elsewhere strive to pinpoint the “threats”—not to the security of the starving or war-torn… but to national security! You get the drift. This is not a system responding positively or rationally to a changing reality. And that’s because it can’t. It can’t stop pursuing profits and bending every effort to beat the competition. That’s what the system is based on. Capital must be invested to create profits—to create growing wealth—for a few. And this is a never-ending cycle, because profits must be reinvested to produce more profits, more growth. For capitalism, this creates two internally unsolveable eco-problems—eco-logical and eco-nomic. The endless cycle means infinite growth in the usage of natural resources, including energy—clearly an impossibility in a finite system. The economy’s foundation on this constant growth means that when growth slows, there is a recession. When growth stops or production actually declines, the system goes into a crisis. Lost jobs mean reduced purchasing power creating a domino effect of business failures, more lost jobs, etc. Dreams of “green capitalism” or “steady-state, no-growth” capitalism can’t overcome these two problems. No matter how green, capitalism has to grow, so it will still hit the “limits to growth.” “No-growth” capitalism is a contradiction in terms. Capital that ceases to grow stops being capital. A no-growth economy could not be governed by market forces. It would have to be a planned economy, planned according to some criteria, some goals—decided by somebody. That somebody should be us—all of us—according to the way eco-socialists think. We will have to replace capitalism with a system that is democratically planned to decide on priorities for production and consumption, with working people—the producers of goods and services and, thus, most tangible wealth—playing a very key role. Our system will be planned to eliminate the incredible waste of capitalism—including war. Crucially, it will be planned to harmonize with the ecology we are all a part of. To have a chance of this working, we’ll need a radical increase in economic democracy as well as political democracy. A new age of equality will make racism, sexism, and all forms of oppression unpleasant historical footnotes and enshrine First Nations’ rights to sovereignty and self-determination. Governance will require a huge increase in participation by working people and all others who are now excluded—something made easier by reduced production due to elimination of waste and rationalization of energy use, which in our system will not mean unemployment for some, but reduced work time for all. 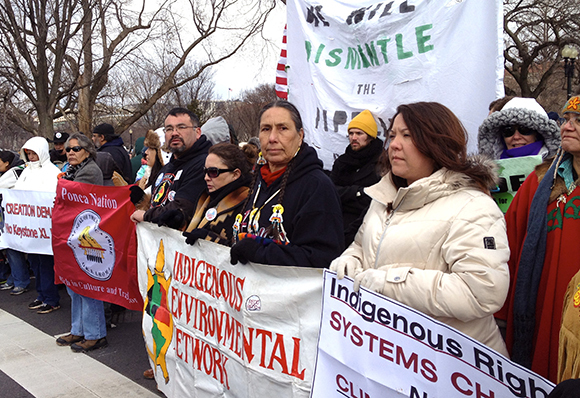 First Nations activists demonstrate against the Keystone XL pipeline and other damaging environmental policies. We call such a system socialism. And how do we get there? An essential part of getting there is building an organization, an ecosocialist organization, that is dedicated to getting there. We aim to build such an organization and play a positive role in creating a movement that can succeed, by using both the lessons of the past and the new lessons to be learned in the coming struggles. History shows that people can transform their societies. They’ve done this by fighting back against the unfairness, the brutality, the oppression, and the growing dangers to everyone that the system is based on. This latter could be unendurable tyranny, economic collapse, warfare, or—in our case—looming eco-disaster (mixed with increasing amounts of all those other things just listed). Of course, all these human-made calamities, including climate change impacts, will hit people harder, the less wealthy and privileged they are, both here and internationally. The twists and turns of these system-changing battles are never predictable ahead of time. But the successful ones all have certain things in common. People fighting against different wrongs, at some point realize they are all fighting different aspects of the same system. And they come together. More and more, they fight side by side. As the future brings more climate change impacts, we will have to keep fighting to stop climate change, but we will also have to fight to democratize survival, and thus expand this process of uniting struggles. We will recognize allies in anti-poverty groups, defenders of public education and public health, the anti-war movement, the fight to defend immigrants, international solidarity work, and in trade unions. I’ll say more about unions in a minute. Society-changers have also always moved beyond words to action. To paraphrase what Ta’ah, a woman elder from Carleen’s  community, said at a meeting on pipelines and tankers this past September, yes, words have power, but sometimes we must use the power of people standing in a line and saying, no, this is as far as you go. That would be an example of civil disobedience or direct action. More and more we will have to use such tactics—seasoned with some wisdom. And such tactics, history teaches, will have to lead to the strategic goal of putting together a huge movement. People power is the only real force that can counter the power of obscene wealth and repression. It can, and has, forced policy changes. When that proved short-term or too partial, it has toppled governments. When the power of the traditional oppressors persisted, people power has replaced entire systems. Of course, this process takes time, which we don’t have a lot of, so we’re going to have to work together to try to make this happen faster without making mistakes that cut across our goals. Our immediate battles to stop carbon extraction, transportation, and combustion—these battles will not by themselves bring about the change we need. But we have to fight them, and while we do, we have to talk widely among ourselves about the increasingly obvious need to create a shift in who has the power to make the big decisions. We will have to engage in the design of alternative living conditions, the change of production and consumption patterns, the need to increase people’s democratic involvement. These discussions and the experience of people in the struggle will lead us to the necessary conclusions about the need to change the system. But something is missing from the picture I’ve painted. Trade unions, historically an important progressive force, especially in British Columbia, are missing in action—or missing as a result of inaction. The Vancouver Ecosocialist Group has been discussing how to help expand an existing, small campaign to get unions involved in the climate change fight. And we hope to convince First Nations and environmentalists to add their efforts, in whatever way they deem appropriate. Why? Because unions can bring decisive weight to struggles ranging from street protests, to political discussions, to unseating governments—both by being there in large numbers which convinces others we have some considerable strength, and by launching supportive strike action. Some unions—even the newly formed Unifor , which represents the majority of energy workers in Canada—do have pretty good written positions related to climate change. The problem is they have been absent from the mobilizations over the past few years. 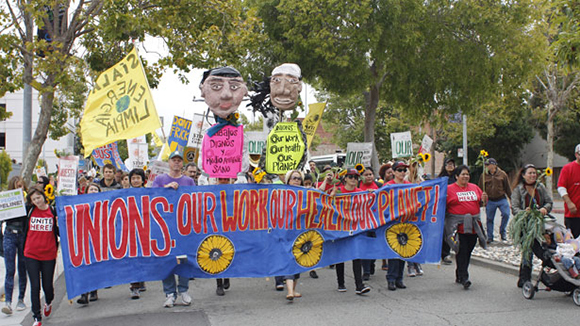 Union workers take action against climate change in Richmond, CA. Photo by Peter Cochrane. The major stumbling block to their participation appears to be the false jobs vs. the environment conflict, which presupposes that some people need only wages but not air, water, and food, while other people require a healthy environment but not an income to live on. Of course, jobs in the tar sands, other carbon-extraction locations, and among the huge related manufacturing and transportation industries—these jobs are going to have to disappear. But the unions themselves have policies dealing with that. “Just transition” policies call for the creation of replacement jobs lost due to environmental improvements or for at least substantial aids in retraining, relocation, and lost-income compensation. Beyond that, the best of such policies call for support to whole communities or municipalities in reconfiguring local economies. But unions have been just as absent from struggles for their own policies and their interests in general as they have been from climate change struggles. Just transition policies lie dormant in the same filing cabinets or on the same hard drives as numerous other fightback policies adopted during the past three decades of corporate and government attacks—attacks on wages and benefits, social assistance, health care, child services, public education, even the right to strike, which, in practice, has been abolished in the federal public sector. Why the demobilization? Unfortunately, the union leadership has conservatized. The thinking behind this conservatization, this demobilization of the members, is rooted in the shrinkage of union strategies down to one—elect the New Democratic Party. What this entails, in the strategic short-sightedness of union brass, is not being part of community fightback coalitions; not holding large, militant demonstrations; and definitely not holding—or even talking about—coordinated regional or provincial strike action, as almost happened in 2004. Because such actions and such talk worry middle-of-the-road voters, who associate unions with the NDP and would therefore be less likely to vote for the NDP. Whatever it takes, and whoever it takes, we have to counter this line of reasoning and convince union members and their unions that being involved in the fight to save the climate is part of, not contradictory to, all their other battles. We need—as much as they do themselves— for them to put the “movement” back in the labour movement. My time’s up, but of course the discussion isn’t over. I expect to hear more of importance from our audience, and the Vancouver Ecosocialist Group hopes to continue and broaden the discussion begun here tonight with our allies in the fight to stop climate change. Unifor was formed on Labour Day, 2013, by a merger of the Communications, Energy and Paperworkers Union of Canada (CEP) and the Canadian Auto Workers (CAW). Gene McGuckin is member of Vancouver Ecosocialist Group and a retired member of Local 1129 of the Communications, Energy, and Paperworkers Union of Canada (CEP).